Your pure heart and patient nature will shine through when you wear this Harry Potter Hufflepuff Reversible Knit Scarf. 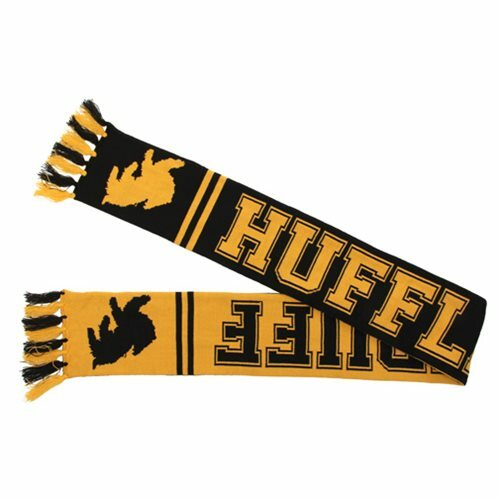 Inspired by everyone's favorite kind-hearted and loyal house, this Hufflepuff scarf is fully reversible and made of high quality soft black and yellow polyester. One side is solid yellow and sports black stripes with the fully detailed black Hufflepuff heraldric badger. Switch to the second side for a solid black look with bright yellow collegiate-style Hufflepuff lettering. Measures about 64-inches long. Ages 14 and up.